Presumably gift or by inheritance from the artist to his mother, Mme. Seurat. the artist's brother-in-law, Léon Appert [d. 1925], Paris; probably by inheritance to Léopold Appert, Paris. Félix Fénéon, Paris, by 1936. Acquired September 1937 by Marie N. Harriman [1903-1970], New York; by inheritance to her husband, W. Averell Harriman [1891-1986], New York; W. Averell Harriman Foundation, New York; gift 1972 to NGA. Seurat and his Friends, Wildenstein & Co., New York, 1953, no. 10, repro. Masterpieces of Impressionist and Post-Impressionist Painting, National Gallery of Art, Washington, 1959, unnumbered catalogue, repro. Exhibition of the Marie and Averell Harriman Collection, National Gallery of Art, Washington, 1961, unnumbered catalogue, repro. 21. De Cézanne a Miró, Museo Nacional de Bellas Artes, Buenos Aires; Museo de Arte Contemporáneo de la Universidad de Chile, Santiago; Museo de Bellas Artes, Caracas, 1968, unnumbered catalogue, repro. Post-Impressionism: Cross-Currents in European and American Painting 1880-1906, National Gallery of Art, Washington, D.C., 1980, not in cat. Loan for display with permanent collection, Munch Museum, Oslo, 1983-1984. A Day in the Country: Impressionism and the French Landscape, Los Angeles County Museum of Art; Art Institute of Chicago; Grand Palais, Paris, 1984-1985, no. 124, repro. Capolavori Impressionisti dei Musei Americani, Museo e Gallerie Nazionali di Capodimonte, Naples; Pinacoteca di Brera, Milan, 1986-1987, no. 45, repro. Impressionist and Post-Impressionist Masterpieces from the National Gallery of Art, Washington, State Hermitage Museum, Leningrad; State Pushkin Museum of Fine Arts, Moscow, 1986, no. 38, repro. Georges Seurat 1859-1891, Galeries nationales du Grand Palais, Paris; The Metropolitan Museum of Art, New York, 1991-1992, no. 205. From El Greco to Cézanne: Masterpieces of European Painting from the National Gallery of Art, Washington, and The Metroplitan Museum of Art, New York, National Gallery of Greece, Athens, 1992-1993, no. 65, repro. Masterpieces from the National Gallery of Art, Washington, Kyoto Municipal Museum of Art; Tokyo Metropolitan Art Museum, 1999, no. 60, repro. Vincent van Gogh und die Maler des Petit Boulevard [Vincent van Gogh and the Painters of the Petit Boulevard], Saint Louis Art Museum; Städelsches Kunstinstitut und Städtische Galerie, Frankfurt, 2001, unnumbered catalogue, repro. Neo-Impressionism: Artists on the Edge, Portland Museum of Art, Maine, 2002, unnumbered catalogue, fig. 3. Divisionism/Neo-Impressionism: Arcadia and Anarchy, Deutsche Guggenheim, Berlin; Guggenheim Museum, New York, 2007, no. 9, repro. (shown only in New York). Impressionist and Post-Impressionist Masterpieces from the National Gallery of Art, The Museum of Fine Arts, Houston; The National Art Center, Tokyo; Kyoto Municipal Museum of Art, 2011, no. 46, repro. Neo-impressionism and the Dream of Realities: Painting, Poetry, Music, The Phillips Collection, Washington, 2014-2015, unnumbered catalogue, fig. 57. 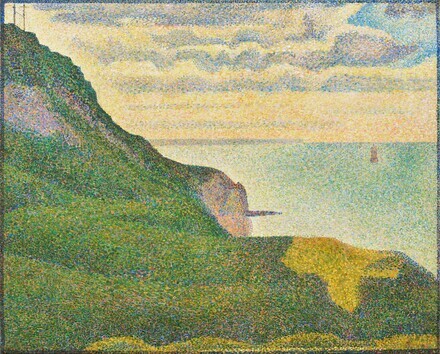 Seurat - Master of Pointillism, Kröller-Müller Museum, Otterlo, 2014, no. 9, repro. Dorra, Henri, and John Rewald. Seurat, l'oeuvre peint, biographie et catalogue critique. Paris, 1959: no. 185, repro. "Recent Acquisitions of American and Canadian Museums." Art Quarterly XXXV )Autumn 1972): 332, repro. European Paintings: An Illustrated Summary Catalogue. National Gallery of Art, Washington, 1975: 324, repro. Walker, John. National Gallery of Art, Washington. Rev. ed. New York, 1984: 512, no. 769, color repro. European Paintings: An Illustrated Catalogue. National Gallery of Art, Washington, 1985: 371, repro. Coman, Florence E. Joie de Vivre: French Paintings from the National Gallery of Art. Washington, 1991: no. 29, repro. Grenier, Catherine. Seurat: Catalogue complet des peintures. Paris, 1991: no. 194, repro. Kelder, Diane. The Great Book of French Impressionism, 1997, no. 6, repro. Kelly, Franklin. "A Lasting Legacy: The Completion of an Unparalleled Gift." National Gallery of Art Bulletin no. 51 (Fall 2014): 10-11, repro.